A real-time strategy game published in 2000 by Activision. The game's look and feel is based primarily on Star Trek: The Next Generation, and features a few of its main characters and ships. Playable factions include the United Federation of Planets, the Klingon Empire, the Romulan Star Empire and the Borg. Rage war across the alpha quadrant. You command four powerful races in a strategic struggle for survival. Who will live? Who will be assimilated? The future depends on your every decision. Multiplayer capability, destroy your friends’ armadas and egos in multiplayer via LAN or internet using one of the four distinct races. Experience revolutionary effects, a true 3-D engine showcases the cinematic action of your 30+ starships. 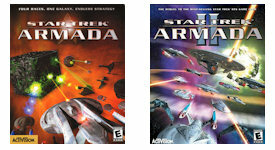 A real time strategy video game published by Activision in 2001, based upon the Star Trek universe. The game showcases events in the Alpha Quadrant between the United Federation of Planets, the Klingon Empire, the Romulan Star Empire, the Cardassian Union, Species 8472, and the Borg. The Borg are back with an insidious new weapon that threatens the very fabric of the galaxy. Meanwhile, a spatial rift has the mysterious Species 8472 flooding into Federation space. Battle in intense competition over LAN and the internet, where the outcome of every encounter depends on your ability to manage your fleets across the galaxy. All-new ship classes, weapons and intense tactical challenges collide in 3-D battles.